This recipe is used as a lotion, hence the name. The final product is technically a body butter– a thick moisturizing cream versus a pumpable lotion. Both body butters and lotions are used to moisturize the skin. I’ve written a complete guide to body butter (including what it is and options for customizing your own body butter, over here.) If you’re looking for a softer lotion you may want to try this silky smooth lotion. Also, I’ve recently updated some of the photos in this post, so if you’re coming over here from Pinterest, the images may look a bit different :). When the weather drops into the fifties (that’s Fahrenheit) in Florida, you know winter has officially arrived. The boots are ready, coats are hung by the door, and the heater is hard at work. With the cold (freezing!) temperatures comes dry skin. Years ago I struggled with the winter season and my skin always feeling dry. I would slather store-bought lotions on my scaly, dry skin and stockpile chapstick, but nothing seemed to work. I desperately needed moisture! After wasting way too much money on lotions and miracle products, I finally discovered the simple answer to my skin’s happiness: homemade products! With a little vinegar, essential oils, cocoa powder, clay, shea butter, and nourishing skin oil I turned my skin around for the better. Moisture, happiness, and clarity were all achieved with the help of homemade remedies that in the end cost pennies (since most ingredients can be used multiple times for multiple products) compared to the speciality bottles and jars I once purchased. I’ve shared many of my favorite homemade products here at Live Simply and still have many more to share with you. 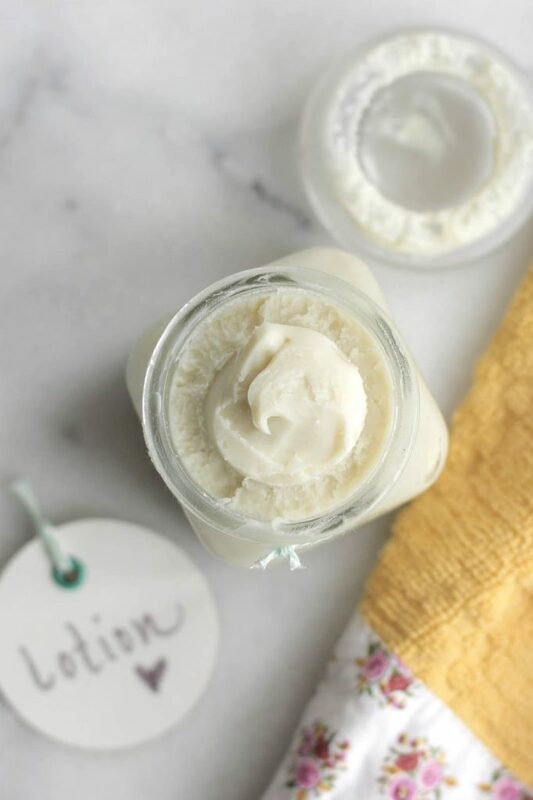 Last year I shared one of my favorite homemade DIYs: Homemade Ultra-Moisturizing Lotion without Coconut Oil. As I explained in the lotion post, I’m all for coconut oil. In fact, I love coconut oil, but after a good year of using a coconut oil moisturizer my skin desperately needed a change. With a little experimenting, a homemade lotion using nourishing oil and shea butter was born. I still use this lotion daily, but I love it the most in the winter when my skin cries out for extra moisture. I’ve heard from so many of you, and I’m happy to report that I’m not the only one who loves this super simple lotion. 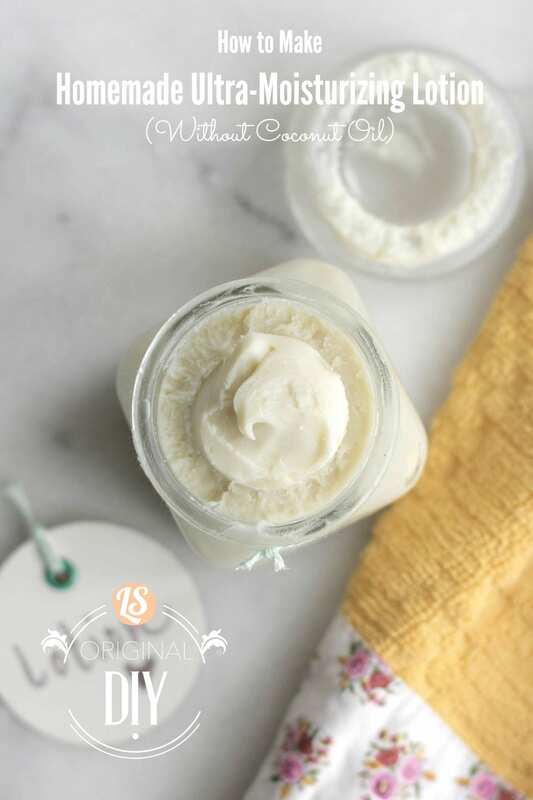 Today, I’m sharing a little bonus to my original lotion recipe, a video tutorial to help you as you make this amazing lotion. As you’ll see in the video, this lotion is super easy to make. This lotion recipe can be doubled and tripled (which is what I like to do). You can keep the surplus of lotion on hand for the winter (it will last about a year) or give the lotion away in small containers for an extra special Christmas gift. I like to make a basket for family members of homemade products for Christmas: homemade lotion (this recipe), bath salts, homemade vanilla extract, and lip balm. After the video you’ll find the simple recipe for this (uh-amazing!) ultra-moisturizing lotion. Remember, this is the same recipe from the original post, but I’ve added it here so you don’t have to flip back and forth from the video post (found here) to the original post. 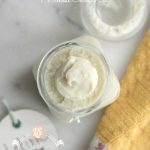 Last year I shared one of my favorite homemade DIYs: Homemade Ultra-Moisturizing Lotion without Coconut Oil. 2 TB skin-nourishing oil such as: jojoba, avocado, apricot, sweet almond oil, or grapeseed oil. This can even be coconut or olive oil. Almond oil is my recommendation since it feels the best on the skin for most people. In a double-broiler (a glass bowl over a pot filled 1/4 the way full with boiling water) over medium-low heat, melt the shea butter. Add in the nourishing skin oil. Turn off the heat. Place the bowl in the fridge or freezer and allow to cool and return to a solid (not hard) form. This takes about 15-20 minutes, depending on location. Once opaque and slightly firm, remove the bowl from the freezer. Add in the essential oils. Using the whisk attachment on your mixer, whip the mixture. You can also use a whisk or fork versus a mixer. This takes just just a few seconds. Don't over-whip. Scoop into a jar and store at room temp. Apply to both body and face as desired. *The essential oils listed are what I originally played around with and used. Feel free to use other skin-friendly essential oils--either just one or a combo--for a total of around 26 drops (or less). You can also make this lotion without using any essential oils. If you'd like to play around with other essential oils, you can read about more options in my body butter tutorial, here. Feeling Greasy? Some folks find that body butter is a bit too greasy to apply all over the body. The good news is that there’s a simple solution for this issue…arrowroot flour/starch. A small amount of arrowroot flour/starch may be added to the liquid oil before pouring the oil into the melted butter(s). If you're interested in adding arrowroot, I'd try adding 1 teaspoon to this recipe. You can see how to do this in my body butter tutorial, here. The whipping time will depend on your mixer, temperature, etc. Once the lotion appears “whipped” stop the mixer and scoop the lotion into a jar. The end result will be a thick lotion that’s absorbed by the skin. This recipe is a wonderful base recipe. Use as is or substitute and add (experiment) according to your skin’s need. As always, do your own research when making your own products and using essential oils. The essential oils suggested are my favorite combinations for my skin, but they may be left out. The amounts and oils suggested in my recipe may be adjusted according to your skin. If you don’t want to make lotion/body butter, I enjoy the EveryDay Shea brand for lotion products, which are sold in most health food stores. Please can you tell me how long this will keep? In plan to make some for myself, and also my daughters, but would like to tell them the shelf life. Hi Lynne, This lotion will last for a year (or longer), but due to the essential oils, a year is recommended. Enjoy!! Thank you so much for making this blog post and video. Every time i looked up a video about DIY face masks they all had coconut oil in them and my face doesn’t care for it, but my body loves coconut oil. I’m glad the post helped you, Tarayn. Enjoy! Hi Kristin, when i looked at the carrot seed oil it states to keep away from children. Does that mean then that they can’t use it? Or is that a general precaution? Thanks! THANK YOU!! I found your website looking for a soaking grain cookie recipe and then saw this… I can not wait to try it! It seems impossible to find something without coconut oil (which causes my face to blotch up!). You’re very welcome, Lindsey :). Enjoy the homemade cookies and lotion…a combo made in heaven ;). I am looking forward to making this lotion recipe. I’ve dabbled in he past, but am happy to use your recipe as a base. I’ve just one question, though, and that’s if I can substitute anything else in place of the carrot seed oil? If so, do you have any recommendations? Hey Gina, Wonderful, I hope you enjoy it. For the carrot seed, you could leave it out entirely or use something like frankincense (that’s what comes to mind), as it’s an amazing skin-care oil. Just made my first batch and I think it turned out well! Do you find that a super tiny amount is all that’s needed? I want to give it away for Christmas, but want to make sure that yes, it’s normal that all one really needs is a small amount at a time. Also: what do you find to be the easiest way to put it into jars and still have it ‘look nice’? I’ve struggled with putting it into jars; it’s hard to fill in the ‘holes’, if that makes sense? You’re correct…a tiny bit goes a very long way. When I used store-bought lotion I would go through quite a bit just to feel moisturized, but this lotion gets the job done with just a small amount. Shea butter is amazing at providing moisture for the skin. I know exactly what you mean about the “holes” in the jars. I use a chopstick (or the handle of a spoon or fork) to take the air out of the little pockets or holes, filling them in by pushing the lotion down in the jar. I’ve found this really helps with compacting the lotion. Mmmm looks nice! Does shea butter leave oily marks? I use coconut oil as a face moisturizer, but when I went to using it on my whole body (because, hey, why not?) I ruined a few items of clothing because the oil left streaks. Le sigh. Hey Jocellyn, I know what you mean about the coconut oil leaving oil streaks. I used to love a coconut oil based deodorant but found it stained my clothes (arm pit stains 🙁 ). I haven’t had any issue with shea butter. It actually absorbs in the skin very nicely and you only need a very small amount to get the “job” done. It’s the jars, oh my, where to find the jars??? Recipes are divine too! Thank you, C Lyons. I find most of my jars at HomeGoods or Target ($1 section). Help. I tried to make this but it came out kind of crumbly. It’s hard and definitely not creamy. What did I do wrong? Or is it just too cold? My house is 66° F.
Hey Michelle, I’m not sure what happened. The temperature shouldn’t affect the texture. I’ll try to help troubleshoot what might have gone wrong: Did you fully melt the shea butter and oil? Which oil did you use? Did you freeze the melted shea and oil just until firm and solid? Did you use a mixer to whip the lotion? The answers will help me figure out what might have happened :). can this be used in the tropics or would it be too runny at our temperatures? Hey Simone, I live in Florida and so far this recipe hasn’t been too runny for our hot (burning hot ;)) summers. For the face and body lotion recipe it calls for joba, avacodo or other oils OR coconut…which is best? Hey Monica, Everyone’s skin is so different, but I prefer jojoba oil. Hi,I made this wonderful lotion without the carrot seed oil. I added grape seed oil instead and It turned out extremely hard. I am wondering if I melt the lotion again and add maybe a TB spoon of olive oil or even coconut oil ,vitamin E oil or Emu oil? Then I prepare it the same way, by putting in freezer for 15 min and whipping for 2 min? Hey Karen, Whipping the lotion for a longer period of time will result in a harder lotion. Generally, it takes about 30 seconds for my lotion to reach its “peak.” You can definitely try melting it again (over very low heat to avoid burning the oils) and whipping it. Hi! I was wondering if the lavender can be substituted for something else? Or is it important to this blend? I have a sensitivity to lavender and I’ve grown to not really like the smell anymore (I know, I’m weird lol). Sorry if this seems like a silly question. I’ve never really used essential oils before. Thanks for your help! Hey Sarah, You can leave the lavender out of this recipe and still make a great lotion :). The recipe says to whip for a minute or two, which I did and the lotion was very hard. So I ready all the posts, re-melted, re-hardened and whipped for 30 seconds. It was still hard but not quite as bad. I used sunflower oil for the nourishing oil which may be the problem. Also, when it says 1/2 cup of shea butter, that is after melted, right? It also seemed really greasy rather than lotiony. I would love to have this come out perfect, so I could give it away. Any advice is appreciated. Hey Jennifer, The lotion should be hard (at least when compared to store-bought lotions), but spreadable. I haven’t tried sunflower oil, so I’m not sure how it will effect the greasy feel of the lotion. The lotion should feel a bit greasy at first, but then easily absorb into the skin after a couple of minutes. Can I use plain butter and olive oil? Hey Isabel, Plain butter will leave the skin feeling greasy and will rot. Shea butter is shelf-stable and absorbs into the skin. Olive oil can be used as the nourishing oil along with the shea butter. But dis tym i made it with cocoa butter, it’s again a success. Awesome, veronicadg! I’m so glad you’re enjoying the recipes. What a sweet gift! Hi! I am excited to try making this. I did wonder . . . I would like to add zinc oxide to provide sun protection. Have you tried this yet? If so, I was wondering how it turned out and how much zinc oxide to add. Thanks! Hey Megan, You may definitely add zinc to this recipe for daytime use. I recommend purchasing a non-nano zinc, and following a similar method (and amount) as my “sunscreen” recipe: https://livesimply.me/2014/06/05/homemade-sunscreen-recipe/. It was a bit dense for her skin at first but I added a little bit more of an ingridient. Thank you so much for sharing, Isabel! I’m so glad she loves the lotion!! Hey Roberta, You can skip the essential oils :). Enjoy!! I thought I would use lanolin for the nourishing oil, perhaps I used too mush because the cream is far too oily. Is there a way to save it and add something to it to make it less oily now or am I stuck with this batch? Hey Jan, Lanolin is a really heavy wax-like oil, so it needs to be used in very small amounts. You could try doubling the shea butter and adding the second addition to the current lotion. Other than that, another option is to keep the lotion for a foot or hand cream for the winter. Hi Kristin, I know you mention that this recipe creates a ‘hard’ lotion. Mine turned out very hard, though softens as I rub it between my hands… I would really rather have a lotion that I don’t have to work so hard to get all over my body. What do you suggest to thin this to more of a lotion? Hey Kay, If your skin will tolerate a bit of coconut oil, you can try whipping the coconut oil into the existing lotion (you could also try adding a bit more oil–start with 1 teaspoon and go from there). Other than that, creating a soft lotion (more of a pump lotion) requires adding water usually, something I haven’t had success with when it comes to this particular recipe. I too have started making my own body butters and lip balm. And while I love the way they make my skin feel, I wonder about bacteria. I do not use any preservatives and my recipe is very similar to yours. I’ve started to add small amounts of Vitamin E oil as I read that it acts as a preservative. But then recently, I read that Vitamin E oil is in fact not a preservative. And that using a jar to store and use the body butter is a breeding ground for bacteria. Even if the body butter looks and smells fine… I’m wanting to make up batches to give away to family, friends and teachers etc. for Christmas. But now I’m a bit concerned about the stability of the body butter. What are your thoughts on this? Lastly, I use raw Shea butter because I love the way it feels on my skin but I find that it really stinks. Do you find this as well? Hey Nikki, I don’t like to use water in recipes like this one because of the risk of contamination, particularly if I’m giving the lotion away or wanting it to last a while. As long as you’re using clean containers (you can sterilize the containers like you would do for canning in the dishwasher or boiling water) your gifts should be fine. Also, if you’re giving the lotion away and have a concern about contamination, I would wear gloves to avoid introducing bacteria into the jars/lotion with your hands. This recipe makes a very small batch, so you’ll need to increase the recipe for multiple gifts. I don’t think you need a preservative for this recipe, unless you want to add vitamin E as an antioxidant for the oils. Today I worked with shea butter for the first time and made this lotion! So far it feels great on my skin. But I’ve got one question! Shea butter has quite an olive-like scent to it, which I can’t really ‘numb out’ with the essential oils. Do you have any tips on how I can mask this scent? btw: I didn’t use the melting method but mashed the butter with a fork, added the oils and mashed it some more before putting it in the mixer. Thanks for all the beautiful inspiring blog posts! Hey Linda, I’m so glad you’re enjoying the blog and lotion. I’m not sure how to go about masking the shea butter scent (other than using strong essential oils). I personally really like the smell of shea butter and haven’t really played around with adding other scents (other than the oils). Sorry, I’m not much help there :). In the future, mango butter can be subbed for the shea butter. Hi I made this but used Shea butter, pumpkin oil and lavender and tea tree. Cuz its what I had.bi was just wondering its very oily and I think I whipped it to much it started to break apart. Could I reheat it and add more essential oils? And maybe some arrowroot to decrease to oilness? Hey Christeen, I recommend waiting a day or two before adding the arrowroot. The oiliness that you’re currently experiencing may decrease once everything settles. If the lotion still needs an adjustment at that point, reheating and adding some arrowroot may work. Hi, I am going to try to make this cream at home but I am wondering, is the carrot seed oil you use an essential oil or carrier oil? For the lavender, rosemary and tee tree you specify “essential” but not for the carrot seed but when I click on the amazon link the bottle says it is an essential oil. Thanks for posting all these recipes, I can’t wait to try them out! Hey Axelle, The carrot seed oil I’m using is an essential oil :). Hi Kristin, I’m really enjoying your blog – thanks for sharing with us! I’m wondering if your children have used this lotion? I’d love to make some for my 2 year old… do you think it’s best to leave out the essential oils? Thanks again! Hey Emily, My daughter occasionally uses this lotion. I would suggest, as you mentioned, leaving out the essential oils with kids. You could add a bit of lavender, if you wanted to add something. Can I used carrot oil(carieer oil) in place of carrot essential oil? What’s the implication of using 1/2 cup each of olive oil and grapeseed? Can I also combine cocobutter and Shea butter? Hi Kristin, I made this with mango butter because of the comments about the smell of shea butter. I had the problem that someone mentioned previously about it crumbling. It is almost like it is a grainy texture until it melts in my hands. I used sweet almond oil. Maybe I didn’t let it harden enough in the freezer or maybe it was because I used a hand mixer? Any ideas? My skin feels really soft, I just need to warm it in my hands before I apply it. Thank you.